This election isn’t just dividing the nation into red and blue color maps-it’s fracturing families along party lines, just in time for the holidays. Many of my friends in San Francisco are dreading Thanksgiving, usually a time of family merriment and togetherness. Why? Many of the city’s “liberal elite” originally hail from those American red counties that tipped the electoral college to a Trump victory. My liberal minded friends are panicking about how to converse with their Republican families over turkey. Will requests for “white meat only” take on a whole new meaning? The thing is, Trump voters probably feel the same about my friends. They voted to protect their world views just like Clinton supporters voted to protect their own. Shelly’s father is probably just as skittish about her visit as she is, thinking she’ll lambast him with city viewpoints he cannot relate to, as he’s too busy trying to keep his own life, and small business, afloat. We are too cozy in our respective political bubbles. We have lost the ability to listen to each other without getting puffy-chested. Finding common ground with our political opposites may be tricky, but, if we try to develop empathy, we’ll not just be better family members, we’ll also become better citizens. My family is *mostly* united in a blue sort of way. We have red factions but pray that politics won’t tear us apart. However, even if it doesn’t, it certainly doesn’t mean we are aligned on everything. There are sections of my family that don’t talk to other sections over some feud that happened 50 years ago. When I asked for details of the “feud” no one could quite recall what it was about. Like any good family, America is stubborn. We cling to our own ideals and often feel that listening to another viewpoint means backing down and becoming weak, throwing our values out with the proverbial bathwater. Facebook and other echo chambers just reinforce our own cherished viewpoints. We ‘like like like’ everything that supports our convictions but rarely bother to read opposing articles. This is a mistake. We will learn a ton from the “other side.” When I did debate in High School I discovered that the only way to win an argument was to start by being intimately familiar with the other side’s perspective. The debater has to be expert in the strengths and weaknesses of each side in order to succeed. Debate can be a good teacher. Truly listening to other people will not only deepen our knowledge of the political issues that we face as a nation, it will also foster respect and compassion for each other as humans. Listening, like really listening, while we put our own agenda aside, is actually a huge sign of strength. If you are a passionate person like me, shutting up is VERY VERY HARD. I have so much to say that my heart isn’t just on my sleeve, it’s projected 5 miles in every direction from a megaphone. It takes every muscle fiber I have to put that megaphone down. But by closing my mouth, my ears open up wider. Just because you listen, doesn’t mean you have to concede. In my experience, agreement doesn’t always matter when it comes to family- It’s the listening that is the gift. By listening without feeling a need to immediately counter, you are telling someone else that they are important. Making someone in your family feel unheard or unimportant has a history of ending badly. I mean, look at Cain and Abel-Adam and Eve’s first sons. Cain, thinking God liked and listened to Abel more, killed him. Right. Um, don’t kill your brother. Get to know him instead. I have heard both political sides say we need to know either other’s America. Red should come to cities and experience diversity and Blue should go to rural areas to understand their plights. Totally agree. But until we can pack our suitcases and explore, let’s just start with listening to one another’s stories. Stories help us move beyond policy agendas and understand one another as human beings. 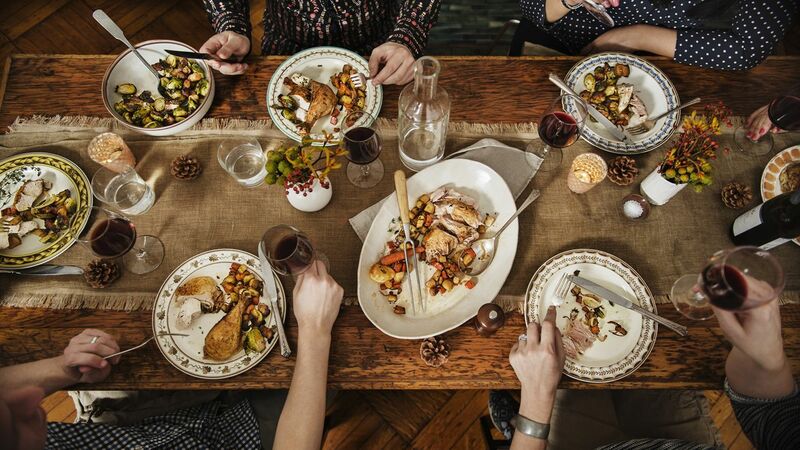 Listening to them may be the gravy we all need to swallow our Thanksgiving meal this year. Regardless if you are red or blue, put down your agenda and pick up your fork to celebrate a feast of togetherness. Listen to each other. And as my Republican Granny would say, “Eat Till It Ouches You.” The good thing about a full mouth of food-you can’t talk too much. You’ll be forced to listen.